For what it’s worth, I’m not 100% sure that the use of music dur­ing writ­ing (or any oth­er ‘enhan­cer’) is a good thing all the writin’ time. Part of me says, ‘No, Hocking, you’ve got to put your­self in the place of the read­er; keep quiet and think.’ I’m also aware of research from cog­nit­ive psy­cho­logy that sug­gests music is det­ri­ment­al to per­form­ance in a giv­en task (because your brain only has a cer­tain amount of atten­tion­al resource, and if you dir­ect some at appre­ci­at­ing a piece of music, you’ll have less remain­ing for your main task). That said, it is a fic­tion writer’s job — in my opin­ion — to take the read­er through a series of emo­tion­al states. To do that, you need to infuse your scenes with emo­tion­al intens­ity, and just as an act­or calls upon his or her exper­i­ence to recre­ate an emo­tion­al state, the writer must do some­thing sim­il­ar. Music can help that. Here are some of the things I listen to when writ­ing (and I make sure I don’t listen to them when I’m not writ­ing; they keep their status as ‘work music’). Like Eric, I think movie soundtracks are great. Music with a verbal com­pon­ent is just going to snare too many brain cycles, and good soundtracks are usu­ally good because they’ve been designed to help cre­ate an emo­tion­al state. Vertigo, North by North-West, Psycho: All these themes are crack­ers. Composed by Hitchcock’s main man, Bernard Hermann, they are com­plex and well craf­ted pieces that will get you in the story mood. I dare any­one to listen to the theme from North by North-West and not run around their liv­ing room try­ing to avoid an ima­gin­ary aero­plane. Hulk: A little deriv­at­ive of the mas­terly Vertigo theme, but sur­pris­ingly deep. Moody. 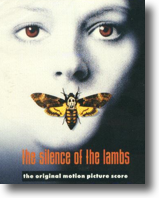 The Silence of the Lambs: An abso­lutely bril­liant score by Howard Shore, and genu­inely fright­en­ing. Conjures memor­ies of a crack­ing film and one of my favour­ite books (yes, I liked Hannibal too, and I loved Hannibal Rising; Thomas Harris is frickin’ awe­some; Note to self: Write a post on how much I love Thomas Harris on a scale of 1 to 10, 10 being my Macbook Pro and 1 being Russell Brand’s hair­cut). My writ­ing music, when I use any, is Mike Oldfield’s Tubular Bells. It’s inter­est­ing — as the mood of the music changes, so does the feel of my writ­ing. Because I work as a radio blokey, I have mil­lions and mil­lions of pro­duc­tions CDs — I tend to make “mix” tapes of my favour­ite tracks to get me in the mood. When I was writ­ing Adventure Eddy, I had a CD which included some key ‘emo­tion­al’ bits of theme music and then some tracks I’d have liked to have had in the movie — believe it or not “South Bound and Down” was on there, from Smokey and the Bandit, for when Eddy and his mates race 600 miles across France in his old sports car to catch a TGV. Roland, what a great image! The writer bash­ing furi­ously at the key­board while SATB blasts out. What a life! Simon, ah… Tubular Bells. Surely you don’t have that one song on repeat ad nau­seum? And I’m with ya Ian — soundtracks are the best back­ground for writ­ing.